The stellated octahedron, or stella octangula, is the only stellation of the octahedron. It was named by Johannes Kepler in 1609, though it was known to earlier geometers. It is the simplest of five regular polyhedralcompounds. The stellated octahedron can be seen as either a polyhedron compound or a stellation. As a compound, it is constructed as the union of two tetrahedra (a tetrahedron and its dual tetrahedron). The vertex arrangement of the two tetrahedra is shared by a cube. The intersection of the two tetrahedra form an inner octahedron, which shares the same face-planes as the compound. It can be seen as a stellated octahedron with tetrahedral pyramids on each face. It has the same topology as the convex Catalan solid, the triakis octahedron, which has much shorter pyramids. 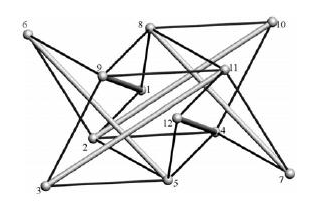 Motropublished a model of a tensegrity structure that conforms to the classic stella octangula. He wrote,” The system is designed on the basis of a triangular anti-prism: struts lie on the triangular bracing faces along the bisecting direction, one of their ends is an apex of a layer triangular face and the other end is in the second parallel plane.” The structure is composed of 6 struts and 18 tensile vectors. The strut length of the model shown is roughly 19 and the tension members are roughly 11 units. The tension members are connected to the 12 nodes and, for each strut one node is only connected to two cables: the corresponding equilibrium is thus realized into a plane. Tensegrity structure that conforms with a Stella Octangula , from Structural Morphology Of Tensegrity Systems by Motro." This page was last edited on 18 January 2019, at 07:38.